Rivastigmine hydrogen tartrate (RHT), one of the potential cholinesterase inhibitors, has received great attention as a new drug candidate for the treatment of Alzheimer's disease. However, the bioavailability of RHT from the conventional pharmaceutical forms is low because of the presence of the blood brain barrier. The main aim of the present study was to prepare positively charged Eudragit RL 100 nanoparticles as a model scaffold for providing a sustained release profile for RHT. The formulations were evaluated in terms of particle size, zeta potential, surface morphology, X-ray diffraction (XRD), Fourier transform infrared spectroscopy (FTIR), and differential scanning calorimetry (DSC). Drug entrapment efficiency and in vitro release properties of lyophilized nanoparticles were also examined. The resulting formulations were found to be in the size range of 118 nm to 154 nm and zeta potential was positive (+22.5 to 30 mV). Nanoparticles showed the entrapment efficiency from 38.40 ± 8.94 to 62.00 ± 2.78%. An increase in the mean particle size and the entrapment efficiency was observed with an increase in the amount of polymer. The FTIR, XRD, and DSC results ruled out any chemical interaction between the drug and Eudragit RL100 polymer. RHT nanoparticles containing low ratio of polymer to drug (4:1) presented a faster drug release and on the contrary, nanoparticles containing high ratio of polymer to drug (10:1) were able to give a more sustained release of the drug. The study revealed that RHT nanoparticles were capable of releasing the drug in a prolonged period of time and increasing the drug bioavailability. Alzheimer's disease (AD) is a progressive neurodegenerative disorder, and is the main cause of the dementia syndrome among older adults  . Since the median age of the world population is growing, AD is rapidly becoming one of the biggest challenges facing universal healthcare system  . Currently, there are neither clinical tests for successful diagnosis nor efficient pharmaceutical agents for the treatment of AD  . Various factors have hindered the development of brain drug delivery systems for the prevention, treatment, and/or delay of this disease and the failure of delivered drugs to effectively reach the brain because of the various protective barriers around the CNS like blood brain barrier (BBB) has been a major challenge  . The BBB is a highly complex structure formed by the vascular layer of brain capillary endothelial cells which strictly controls and limits the exchange of substances between the CNS and the peripheral circulation. It should be mentioned that the tightness of the BBB prevents the successful entrance of most therapeutic agents  . Given such premises, the attention of researchers have been mainly attracted to the development of novel drug delivery systems, allowing the pharmaceutical agents to be selectively transferred across the BBB  . Among various drug carriers discussed in the literature (i.e. antibodies, liposomes, or nanoparticles), polymeric nanoparticles have drawn considerable interest as potential drug delivery devices for CNS treatment, since they have shown to be capable of sustaining the release and delivery of therapeutic loads to the brain and other parts of the body , . By definition, nanoparticles commonly used as drug delivery systems are solid submicron colloidal particles ranging in size from about 10 to 1000 nm which are made generally from natural or synthetic polymers and show different properties compared to their bulk substitute  . Nanoparticles have more surface area-to-volume ratio, providing a safe and reliable platform for the delivery of hydrophilic drugs, hydrophobic drugs, therapeutic proteins and peptides, and other biological macromolecules. Typically, the drug of interest is entrapped, surface adsorbed, or bound covalently and/or encapsulated into or onto the nanoparticle matrix (6). Another reason why nanoparticles are attractive for brain therapy is based on the fact that their ability to cross the BBB completely depends on the physicochemical characteristics (i.e. size, shape, surface modification) of the nanoparticle formulation and does not depend anymore on the chemical features of the therapeutic agents which are entrapped within the nanoparticles  . Ideally, nanoparticles with elevated drug entrapment efficiency would reduce the quantity of carrier demanded for the administration of a sufficient amount of drug at the target site, and drug wastage during the manufacture  . Eudragit RL 100 is the suitable choice of synthetic polymers for the preparation of nanoparticulate delivery systems. It is a copolymer of poly (ethylacrylate, methyl-methacrylate, and chloro trimethyl-ammonioethyl methacrylate) having a high level of quaternary ammonium groups (8.8-12%) and is generally utilized for the enteric coating and also preparation of dosage forms having controlled-release profile , . Eudragit RL is insoluble in physiological pH and capable of swelling, thereby providing one of the most popular materials for the dispersion of drugs  . Besides, positive charge of Eudragit RL nanoparticles may allow an increased retention of the associated drug on the mucosal surfaces  . The simplest method for the preparation of polymeric nanoparticles containing drug is the solvent displacement method also known as nanoprecipitation method, developed by Fessi, et al.  . Briefly, this method requires two solvents that are miscible in each other. Typically, both the polymer and the drug must be dissolved in the first system (the solvent), but not in the second (the non-solvent). However, in addition to solvents miscible with water and non-halogenated solvents, immiscible solvents such as dichloromethane can also be used. Nanoprecipitation, a rapid desolvation of the polymer renders the precipitation of nanoparticles when the polymer solution is added to the non-solvent. Indeed, having the polymer-containing solvent has diffused into the dispersing medium, the polymer immediately precipitates, involving immediate drug entrapment. The rapid nanoparticle formation is ruled by the so-called Marangoni effect, which is subjected to interfacial turbulences that occur at the interface of the solvent and the non-solvent and results from complicated and cumulated phenomena like flow, diffusion, and surface tension variations  . Nanoprecipitation technique is easy, less complex, less energy consuming, and widely applicable without any additives for the manufacture of defined nanoparticles  . However, the presence of a stabilizer is of very importance to avoid aggregate formation and to impart stability to nanoparticles during the nanoprecipitation technique  . The poloxamers, particularly poloxamer 407, have been exploited for use in the preparation of nanoparticles as emulsifying or solublizing agent. Poloxamer 407 is a triblock copolymer that consists of a central hydrophobic block of polypropylene glycol surrounded on each side by two hydrophilic blocks of polyethylene glycol  . Rivastigmine hydrogen tartrate (RHT) is a short acting cholinesterase inhibitor and has been broadly applied in the treatment of patients suffering from mild-to-moderate AD  . It is currently available in the form of a transdermal patch applied to the skin, as oral capsules, and as an oral solution  . In spite of many benefits, hydrophilic nature of RHT limits its entry into the brain after oral therapy; thus necessitating frequent dosing, leading to serious cholinergic side effects  . Considering the ideal potentials of Eudragit RL, as well as the features of nanoparticulate-based drug delivery systems, here, we report on the preparation, characterization, and in vitro release evaluation of a biocompatible nanoparticulate system of RHT prepared through a nanoprecipitation technique using Eudragit RL 100 as the polymer, poloxamer 407 as the stabilizing agent, and acetone as the organic phase. The prepared novel nanoparticle system was characterized by its particle size, polydispersity index (PDI), morphology, and drug loading efficiency. Furthermore, the In vitro release profile of RHT from nanoparticles was evaluated and compared with RHT solution. Eudragit RL 100 was received as a kind sample from Akbarie Co. (from RÖhm Pharma GMBh, Weiterstadt, Germany). RHT was obtained as a gift from Tofigh-daru, Iran (engineering research company). Poloxamer 407 (Pluronic® F-127, MW: 9840-14600) was provided by sigma-Aldrich, USA. Dialysis bag (cut off 10,000-12,000 Da) was supplied by Biogen (Mashhad, Iran). Acetone, ethanol, potassium dihydrogen phosphate (KH 2 PO 4 ) and sodium hydroxide (NaOH) were purchased from Merck (Germany). All other solvents and reagents were of analytical grade. Deionized water was used throughout this study. The Eudragit RL 100 nanoparticles containing RHT were prepared through a nanoprecipitation or solvent displacement method using different polymer to drug ratios (4:1, 7:1, and 10:1) ([Table 1])  . RHT (35 mg) was dissolved in 2 mL of water. Separately, different amounts of Eudragit RL 100 (140, 245, and 350 mg) were dissolved in 5 mL of acetone. The mixture was formed by injecting the RHT aqueous solution dropwise into the Eudragit RL 100 organic solution and was magnetically stirred at 500 rpm (Heidolph Centrifuge 5810 R, Germany). This mixture was then added into 10 mL of an external aqueous solution under agitation containing 2 % (w/v) of poloxamer 407 as a suspension stabilizer. Thereafter, the mixture was magnetically stirred at room temperature for 2 h at a speed of 400 rpm to evaporate the organic solvent. The hardened nanoparticles were recovered by centrifugation (Eppendorf, Germany) for 60 min at 12000 rpm and 4 °C and washed three times via resuspending the nanoparticles in 5 mL of deionized water, followed by centrifugation for removal of any unloaded RHT. Nanoparticles were then lyophilized and stored at 4-8 °C for further uses ( [Figure 1]). Similarly, blank nanoparticles were prepared by using the above technique without RHT in formulation. Figure 1. Nanoparticles preparation procedure with Eudragit RL 100 polymer. A dynamic light scattering particle size analyzer (Malvern, UK) was used for the measurement of mean size, zeta potential, and PDI of the prepared nanoparticles where the PDI offers a good indication of the breadth of variation in the nanoparticle size distribution  . The morphology of nanoparticles was examined via a high-resolution scanning electron microscopy (SEM, MIRA3 TESCAN, Czech Republic). The specimens were removed and mounted on a metal stub using double-sided carbon adhesive tape and coated with platinum/palladium alloy under vacuum. The FTIR spectra of pure RHT, Eudragit RL 100, poloxamer 407, physical mixture of pure RHT and Eudragit RL100, lyophilized Eudragit nanoparticles, and lyophilized Eudragit-RHT nanoparticles were obtained by a computerized FTIR spectroscopy Tensor 27 (Bruker, Germany) operating in the scanning wave number range of 400-4000 cm -1 at 1 cm -1 resolution. The DSC thermograms of RHT, Eudragit RL 100, poloxamer 407, physical mixture of RHT and Eudragit RL100, and blank and RHT loaded nanoparticles were recorded by a DSC (Shimadzu, Japan). Samples (2 mg) were sealed into standard aluminum pans and heated from 25 °C to 300 °C at a heating rate of 10 °C/min. X-ray powder diffraction patterns of RHT, Eudragit RL 100, poloxamer 407, physical mixture of RHT and Eudragit RL 100, and blank and RHT loaded nanoparticles were measured using a Bruker Axs, D8 Advance diffractometer with nickel-filtered CuKα radiation (operating at 40 KV, 20 mA). The scanning rate was 4 °C/min over a 2θ range of 10 ° - 90 °. RHT entrapment efficiency was expressed as the ratio of the RHT amount measured in the collected nanoparticles to the total RHT. The in vitro drug release from Eudragit nanoparticles was also performed using dialysis bag diffusion technique  . Briefly, 30 mg of lyophilized nanoparticles containing RHT was placed into the dialysis bags (cut off 10,000-12,000 Da). Then, dialysis bags were immersed in 200 mL dissolution medium (phosphate buffer, pH 7.4) in USP dissolution apparatus type II (paddle) with a speed of 100 rpm at 37 ± 1 °C. Aliquots of 3 mL of the dissolution medium were withdrawn at specific time intervals and replaced with fresh quantity of the dissolution medium to maintain sink conditions. The concentrations of RHT in the samples were determined by the UV-spectrophotometric assay at 263.4 nm. Experiments were repeated three times for each formulation. Dissolution efficiency (DE) was calculated from the area under the dissolution curve at time (measured using the trapezoidal rule) and was expressed as percentage of the area of the rectangle described by 100% dissolution in the same time. Statistical analyses of the release data were performed by comparing the DE, t50%, and the difference factor (f 1). The release mechanism was evaluated using Korsemeyer-pepas equation. Nanoprecipitation involves the precipitation of a preformed polymer from an organic solution and the diffusion of the organic solvent in the aqueous medium in the presence or absence of a surfactant  . This nanoprecipitation method involves the use of a partially water-miscible solvent, which is previously saturated in water to ensure the initial thermodynamic equilibrium of both liquids. In this regard, at first polymer is dissolved in the water saturated solvent, and then this organic phase is emulsified under vigorous agitation, in an aqueous solution holding a stabilizer. It has been displayed that each droplet is responsible for producing several nanoparticles and that these nanoparticles are formed by interfacial phenomena during solution described by the convection effects caused by interfacial turbulence. Therefore, it is proposed that nanoparticles are formed because of a physicochemical instability produced by solvent transport by a similar mechanism to that used to explain spontaneous emulsification processes (diffusion stranding mechanism). The central idea is that diffusion of solvent from the globules harbors molecules into the aqueous phase, and forms local regions of supersaturation from which new globules or polymer aggregates (not totally desolvated) are formed. The stabilization of these "protonanoparticles" in the presence of a stabilizer is very imperative to avoid their coalescence and the formation of agglomerates. Therefore, if the stabilizer remains at the liquid-liquid interface during the diffusion process and if its protective effect is adequate, then nanoparticles would form after an entire diffusion of solvent. Therefore, a nanoprecipitation method was used for the preparation of nanoparticles containing water-soluble RHT drug. The rapid diffusion of the organic phase out of the polymer phase into the external aqueous phase leads to the formation of nanoparticles. Nanoparticles exhibited a uniform size distribution and the average particle diameters were approximately within the range of 118 to 158 nm ([Table 2]). Mean particle size of blank nanoparticles was found to be almost similar to that of drug-loaded nanoparticles (219.1 nm). Eudragit RL 100 being a positively charged polymer imparts cationic nature to particles where the zeta potential values of nanoparticles were found within the range of 22.5 to 30.8 mV. The zeta potential of the prepared RHT nanoparticles is shown in [Table 2]. SEM analysis of RHT, blank, and RHT-loaded nanoparticles was performed ( [Figure 2]). The SEM micrographs of RHT formulations showed the relatively smooth surfaced nanoparticles with spherical shape and were uniformly distributed. It also confirmed the particle size obtained by the particle size analysis. Figure 2. 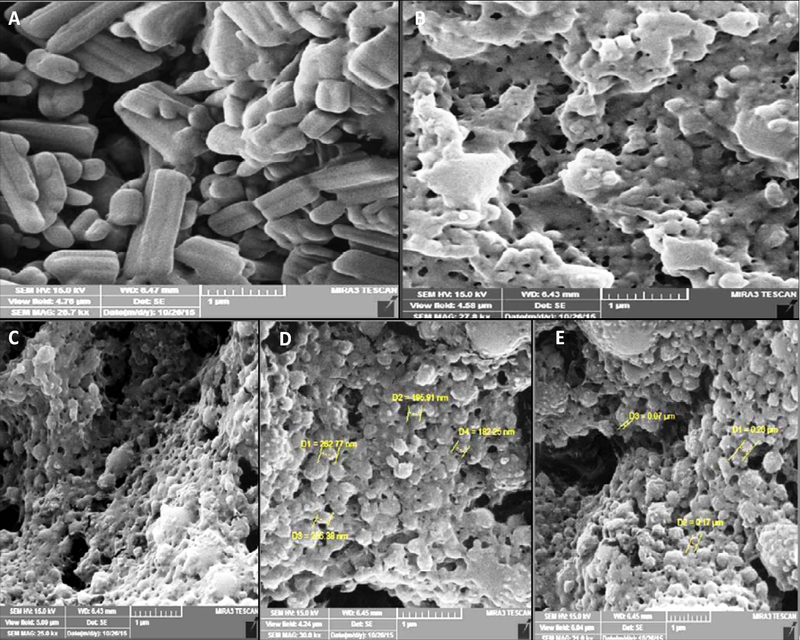 SEM images of (A) RHT; (B) E3 blank; (C) RHT nanoparticles: E1 (EU:RHT) 4:1 ratio; (D) E2 (EU:RHT) 7:1 ratio; and (E) E3 (EU:RHT) 10:1 ratio at 1000× magnification. FTIR analysis of samples was performed to investigate the interaction between the drug and polymer. [Figure 3] indicates the comparative FTIR peaks of RHT, Eudragit RL 100, Poloxamer 407, physical mixture, blank and RHT-loaded nanoparticles. The pure RHT RHT-loaded nanoparticles. The pure RHT showed the CH 3 anti-symmetric stretching vibrations in the region of 2974 cm -1 , while the symmetric stretching vibrations can often be found within 2850-2880 cm -1 . Figure 3. FTIR thermogram of (A) pure RHT, (B) from down to up RHT. (a) Eudragit RL 100; (b) blank; (c) E3; (d) poloxamer 407; (e) E1; (f) E2; (g) E3; and (h) physical mixture E3. The emergence of a strong band in the IR spectra around 1719.25 cm -1 displays the presence of the carbonyl group in the molecule, which is due to the C=O stretching. The C-H stretching in the benzene ring is assigned at 3067-3093 cm -1 . The C-H in-plane bending are at 1145.70-1590.19 cm -1 . A carbamate band shown at 1694 cm -1 to a higher wavenumber, 1725 cm -1 , was also seen. The spectra produced by the FTIR for the Eudragit RL100 are presented in [Figure 3]. In the spectra, the strong bands in the region between 1150-1190 cm -1 and 1240-1270 cm -1 are due to the stretching of carbonyl (ester) groups present in the Eudragit RL 100. There are also stretching bands of C(=O) ester vibration at 1734.01 cm -1 . IR absorption frequency of OH stretch at 3437.91 cm -1 is presented in [Figure 3]. 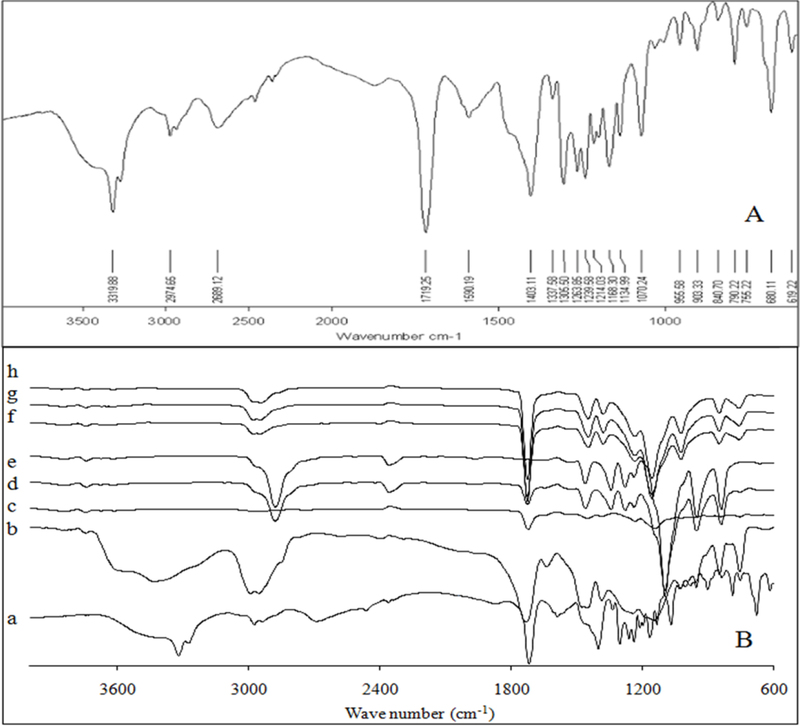 The FTIR spectra of poloxamer 407 showed the major absorption bands (stretching) at 3460.19 cm -1 (O-H), 2885.42 cm -1 (CH), and 1112.89 cm -1 (C-O). For nanoparticles observed the stretch band of C-H (alkane group) at 2974 cm -1 , stretch band of carbonyl group at 1719 cm -1 , bending vibrations in -C-H at 1403 cm -1 , stretch band of ester group C-O at 1070 cm -1 . 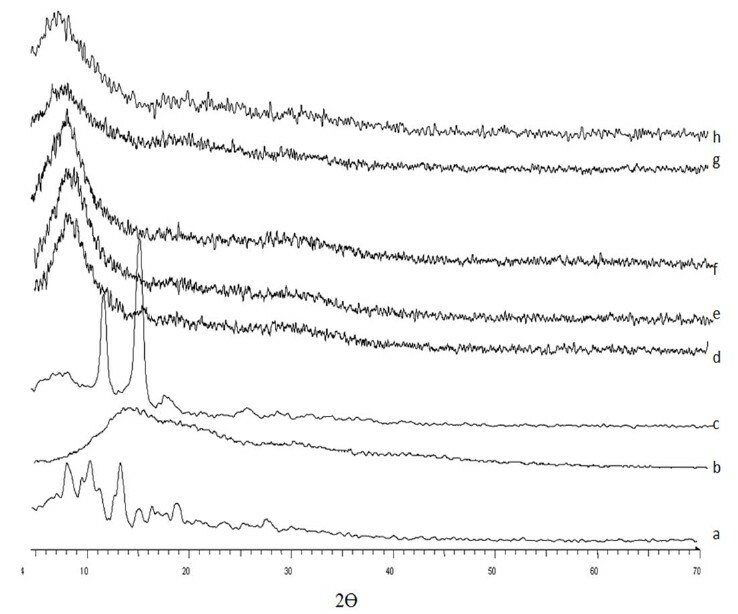 Freeze dried RHT-loaded nanoparticles exhibited mainly the Eudragit RL 100 absorption peaks with few overlapping peaks from the RHT. It can be concluded that no strong drug polymer interaction occurred inside the nanoparticles. 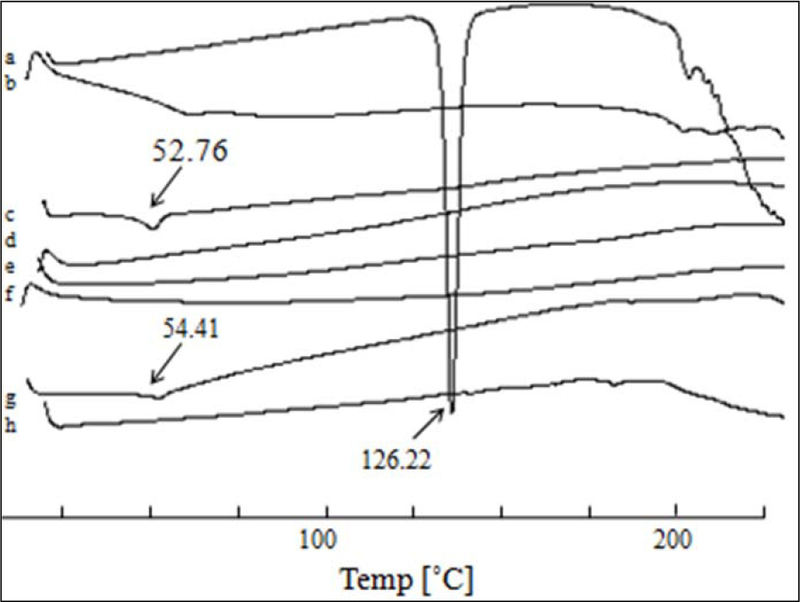 In order to study the crystalline or amorphous nature of formulations and to evaluate the interactions between the drug, polymer, and other materials, DSC experiments were carried out ( [Figure 4]). According to the results, pure Eudragit RL100 exhibited amorphous nature of polymer and no endotherms were observed in its DSC thermogram. The pure RHT demonstrated a sharp peak at 126.22 °C which can be related to its melting point. In physical mixture, the RHT peak (122.36 °C) shifted to lower temperature. Poloxamer 407 showed an endothermic peak (Tm) at 52.76 °C. Figure 4. DSC thermogram of (a) RHT; (b) Eudragit RL 100; (c) poloxamer 407; (d) E1; (e) E2; (f) E3; (g) blank nanoparticles of E3; and (h) physical mixture E3. The DSC curve of nanoparticles did not show the endothermic peak of RHT. In the thermogram of the blank E3, there was a small endothermic peak at 54.41 °C which corresponds to the phase transition of poloxamer ( [Figure 4]). The Powder XRD diffraction technique was used to investigate the physical nature of the encapsulated drug. [Figure 5] displays the X-ray diffractograms of samples. RHT showed the characteristic peaks at angles of about 9.6, 11.4, 13.4, 14.2, 15.7, 19.2, 20.2, 22.4, 24.8, 26.8, 29.6, 31.3, and 33.7 ° 2θ. Figure 5. XRD thermogram of (a) RHT; (b) Eudragit RL 100; (c) poloxamer; (d) E1; (e) E2; (f) E3; (g) blank nanoparticles of E3; and (h) physical mixture E3. The presence of sharp peaks in the diffractogram of RHT showed its crystalline nature while the diffractogram of polymer (Eudragit RL 100) displayed an amorphous structure. The physical mixture of RHT and Eudragit RL 100 (E3, 10:1) resulted in a relatively less crystalline form which represented the characteristic peaks of RHT at 18.68, 22.37, 24.78, and 26.24. Poloxamer showed a crystalline nature and manifested several distinct peaks at 13, 18.5, 23, 26, 35.5, 39, and 43. The findings showed that the drug entrapment efficiency increased from 38.40 ± 8.94 to 62.00 ± 2.78 with increasing the ratio of polymer:drug in the formulation ([Table 1]) and formulation E3 had the highest entrapment efficiency (P < 0.05). The nanoparticle formulations made of the polymer to drug ratios of 4:1, 7:1, and 10:1 showed 47.25%, 40.39%, and 21.50% drug release in 30 min and 77.16%, 72.22%, and 64.99% release in 8 h while 101.20% drug was diffused into the release medium in 30 min from free RHT used as the control. The release profiles of nanoparticle formulations suggest an initial fast release which may be due to the drug adsorbed on the surface of the nanoparticles followed by a sustain manner resulting from the encapsulation of the drug in the nanoparticles. The sustaining behavior was more dominant as the polymer to drug ratio was increased from 4:1 to 10:1. F3 nanoparticles showed lower DE% (61.13%) compared to free RHT which exhibited faster release as indicated by its DE (100.14%) ([Table 3] and [Figure 6]) (P < 0.05). Figure 6. Cumulative percent release of RHT from nanoparticles with different polymer ratios and free RHT. The difference factor also displayed that the release profiles of nanoparticle formulations were significantly different from those of free RHT (f1 , 33.38 - 47.45) ([Table 3]). The drug was gradually released at a later time due to the diffusion of the drug from the flexible matrix structure. n values computed from Peppas model (n = 0.182-0.592) offer that the drug release may occur mainly through diffusion (Fickian) process and only formulation E 3 exhibited non-Fickian release mechanism. The values of regression coefficients (R2) for E1, E2, and E3 nanoparticles show the highest correlation as 0.934, 0.994, and 0.973, respectively ([Table 4]). In this nanoprecipitation method high-energy/high-shear/high-pressure mixing devices was not used, because the formation of nanoparticles is driven by the spontaneous diffusion of an organic solvent into the water. Another merit of nanoprecipitation is that non-halogenated organic solvents are used as dispersed solvents for the polymer. They are less toxic and more eco-friendly than halogenated organic solvents used in the emulsion solvent evaporation/extraction processes. A major drawback is that the success of preparing nanoparticles is restricted only to a narrow region of the polymer/solvent/anti-solvent composition map, the so called Ouzo region  . Beyond the Ouzo region, microparticles rather than nanoparticles are produced. It should also be noted that during the nanoprecipitation, solvent shift happens as a result of the dilution of polymeric solutes in the antisolvent (water). This causes the nucleation of very small aggregates of polymeric molecules, aggregation of these nuclei, and formation of nanoparticles. Therefore, a large amount of water should be added into a polymeric dispersed phase. Verma, et al. reported that sulfacetamide-Eudragit RL 100 nanosuspensions can be made by the solvent displacement method similar to that employed by Fessi, et al. (25). Nanoprecipitation is generally designed for the encapsulation of hydrophobic drug molecules ,, . However, it has been proposed for the entrapment of hydrophilic molecules into the nanoparticles ,,,,, . For example, recent research dealing with water-soluble drug incorporation has provided encouraging results. Peltonen, et al. showed the encapsulation of sodium cromoglycate. In brief, the sodium cromoglycate was formulated into PLA (polylactic acid) biodegradable nanoparticles by a modified nanoprecipitation method. This study demonstrated a new formulation method of biodegradable nanoparticles with highly efficient encapsulation of hydrophilic drug. This work provided evidence that nanoprecipitation could also occur with solvents (as acetone or DMSO) and ethanol (as an aqueous solution) and can also lead to nanoparticle formation and possibly extend the use of nanoprecipitation to more hydrophilic drug  . Other studies have reported that poloxamer used as the stabilizer of nanoparticles crystallize upon freezing impairing the maintenance of nanoparticle properties in the absence of cryoprotectives. On the other hand, nanoparticles stabilized by poloxamer were not resistant to the freeze-drying procedure. The aggregation of nanoparticles could be explained by an increase of the solubility of poloxamer in the bulk solution during the freezing process  . It has been found that the solubility of poloxamers is higher in cold water than in hot water, due to hydrogen-bond formation between the water molecules and the numerous ether-type oxygen bonds of the poloxamers. A decrease in temperature favors the salvation of the poloxamer by increasing the hydration of shell of poloxamer, thus the dynamic motion of the surface-attached chains is broken and the latter tend to remain in the bulk solution. Increasing the polymer concentration resulted in a higher viscosity of the organic phase, which led to an increase in the diffusional resistance to the drug molecules moving from the organic phase to the aqueous phase, thereby increasing the amount of drug molecules entrapped into the polymer matrix of nanoparticles. The size of nanoparticles was found to increase with increasing the polymer concentration maybe due to an increase in the viscosity of the organic phase which renders the solvent diffusion more difficult and results in larger nanoparticles size. Nanoprecipitation has potential to formulate small-sized and narrowly-distributed nanoparticles and a wide range of polymer materials like polymethacrylate (Eudragit RL100) can be used  . It has been shown that the theoretical drug loading (E1 to E3) may also affect the particles size and entrapment efficiency (P < 0.05)  . The zeta potential measurement for the nanoparticles gives an indication of the storage stability and in vivo behavior of the colloidal nanosystems. Generally, the aggregation of colloidal particles is decreased with large zeta potential values because of the strong electrostatic repulsion of particles with each other , . A minimum zeta potential of ±30 mV is required for an electrostatically stabilized nanosuspension, whereas a minimum zeta potential of ±20 mV is desirable in the case of electrostatic and steric stabilization. It has been reported that both the stabilizer and the drug govern the zeta potential of a nanosuspension  . These results suggest that the zeta potential of nanoparticles increases (22.5-30.8 mV) with increasing the concentration of polymer solution ([Table 2]). FTIR studies showed the characteristic peaks of RHT, confirming the purity of drug. No significant alteration was observed in the absorption spectra of physical mixture, as incorporation of drug into the poloxamer did not modify the position of functional groups. In the FTIR spectra of the blank nanoparticles of E3, peaks were observed at all the main absorption bands of Eudragit and poloxamer. Considering DSC thermograms, it is evident that the DSC curves of all nanoparticle formulations are almost the same. This indicates that the RHT might be dispersed/dissolved molecularly in the Eudragit RL 100 polymer during the preparation of nanoparticles. The thermal behavior of the freeze dried nanoparticles suggested that the polymer inhibited the melting of the drug crystals. However, the physical mixture of drug and polymer showed small drug melting peak. This suggests that the drug was dispersed in the nanoparticles in an amorphous form. The most probable reason for the appearance of slightly shifted broad endothermic peak is due to melting of the adsorbed poloxamer present on the nanoparticle surface. This supports the results obtained from FTIR and DSC. Solid state analysis of the lyophilized nanoparticles (E1, E2, and E3) showed that the drug is dispersed in the polymeric matrices in a semicrystalline to microcrystalline form. Since the polymer is entirely amorphous in nature, entrapment of the crystalline RHT (sharp intense peaks as seen in [Figure 5]) into the polymeric nanoparticles reduced its crystallinity to a greater extent. Similar observation has been seen for all nanoparticles. This is apparent from the disappearance of the most peaks in the nanoparticles compared to the drug or physical mixture. There may also be the possibility of overlapping of drug peaks by the background diffraction pattern of the amorphous structure of polymer. Thus, it can be inferred that the drug is present inside the nanoparticles a semicrystalline to microcrystalline form. This finding was also in agreement with the flurbiprofen loaded acrylate polymer nanosuspension prepared by Pignatello, et al  . According to [Figure 6], a fast release characteristic of RHT, independent of the processing conditions, with most RHT release from particles starting within 30 min was observed. The release curve suggests initial fast release. It may be due to the unentrapped drug adsorbed on the surface of the nanoparticles. Besides, the dissolution and release of surface-bound poloxamer 407 molecules caused the initial high release. The increased Eudragit RL 100 proportion increased the loading efficiency (38.40-62%) in the nanoparticle formulations (from E1 to E3). At higher proportions of polymer (E3 formulation, 10:1 polymer to drug ratio), the formation of compact polymer matrix and higher degree of encapsulation of drug (62%) into the matrix would have resulted in the decreased burst release (21.50%) ([Figure 6]). The in vitro drug release profile showed a decreased rate of drug release with an increase in the total polymer proportion ([Figure 6]). According to the results, decreasing the amount of polymer (as E1) leads to saturation ammonium groups of polymer by drug molecules and increasing the amount of complex Eudragit RL 100-RHT and possibly provides hydrophilicity of prepared systems, which increases the dissolutive nature of the drug release. While, lower saturation of polymer ammonium groups by drug (in constant concentration) occurring at higher polymer to drug ratios (as E3), decreases the drug release. Therefore, the polymer content played a major role in determining the burst release and release duration along with an impact on the physicochemical properties of nanoparticles. Increasing the quantity of Eudragit RL 100 from 140 to 350 mg resulted in a significant decrease in the burst effect from 47.25% to 21.50% in the case of formulation E1 to E3. The t 50% for E1 was found to be 60.98 min while for that of the formulation E3 was 85.44 min ([Table 3]). Comparison of various release characteristics of RHT from different nanoparticle formulations and free RHT is shown in [Table 3]. Besides, a decrease in Eudragit content from 340 to 140 mg resulted in a decreased average particle size (154-118 nm), which increased the effective surface area exposed to the drug release media, resulting in an increased drug release (64.99-77.16%). Verma, et al. showed that acetazolamide-loaded Eudragit RL 100 nanoparticle suspension can be prepared by the nanoprecipitation method. According to the drug release study, almost all the formulations released 80% of the drug within 8 h.
Batch with the lowest drug entrapment efficiency and smaller average particle size gave a faster drug release  . Multiple mechanisms such as swelling, erosion, and polymer relaxation might play a role in the drug release. In the case of prepared formulations with varying drug to polymer ratios, the release exponent 'n' varied from 0.182-0.592, suggesting a Fickian (as in E1 and E2) and non-Fickian or anomalous (as in E3) drug transport mechanism in the drug release. This could be because of the rapid dissolution of poloxamer 407 from the surface of the nanoparticles and creation of pores or channels in the nanoparticles through which drug release has occurred. At the end of dissolution, the release rate decreased with time because of the increase in the diffusion path length of the drug. The change in diffusion path length was not only because of the gradual depletion of the drug from the matrix, but also because of the moving boundaries such as swelling and erosion. The duration of drug release was also greatly affected by the proportion of polymers in the formulations. As the polymer quantity was increased, the drug release was found to be more sustained for a longer period of time. From the slope of the appropriate plots, the release constants were calculated and the regression coefficient (R 2 ) was determined. It was found that the mechanism of drug release follows both Fickian (E 1 and E 2 ) and non-Fickian (E 3 ). Finally, nanoparticles of E3 (polymer to drug ratio of 10:1) were stored as lyophilized powder for future studies, since they had the highest drug loading efficiency (62%) with a small particle size (154 nm) and sustained release behavior releasing 64.99% of the drug within 24 h.
Various RHT-loaded Eudragit RL 100 nanoparticles were prepared using the nanoprecipitation technique. The formulation E3 (10:1, polymer to drug ratio) was found to show the maximum drug entrapment efficiency (62.00 ± 2.78%) with a mean particle size and zeta potential of 154 nm and +26.8 mV, respectively. The nanoparticles were found to provide a biphasic release pattern; an initial burst release followed by a sustained release mannr. These results demonstrated that Eudragit RL 100 nanoparticles are potentially promising systems for the efficient delivery of RHT. The Eudragit nanoparticles could be used as novel drug delivery systems for brain-targeting delivery of the RHT particularly through intranasal administration. In this case, the positively charged nanoparticles could help in effective adhesion to the nasal surface which in turn would enhance the nasal bioavailability via the olfactory system or the trigeminal nerves into the CNS. The content of this paper is extracted from the Pharm.D thesis of Sara Salatin (grant No. 110) which was financially supported by the Research Council of Tabriz University of Medical Science, Tabriz, I.R. Iran. Zhang C, Wan X, Zheng X, Shao X, Liu Q, Zhang Q, et al. Dual-functional nanoparticles targeting amyloid plaques in the brains of Alzheimer's disease mice. Biomaterials. 2014;35(1):456-465. Nazem A, Mansoori GA. Nanotechnology for Alzheimer's disease detection and treatment. Insciences J. 2011;1(4):169-193. Doggui S, Dao L, Ramassamy C. Potential of drug-loaded nanoparticles for Alzheimer's disease: diagnosis, prevention and treatment. Ther Deliv. 2012;3(9):1025-1027. Fazil M, Md S, Haque S, Kumar M, Baboota S, Sahni JK, et al. Development and evaluation of rivastigmine loaded chitosan nanoparticles for brain targeting. Eur J Pharm Sci. 2012;47(1):6-15. Patel T, Zhou J, Piepmeier JM, Saltzman WM. Polymeric nanoparticles for drug delivery to the central nervous system. Adv Drug Deliv Rev. 2012;64(7):701-705. Salatin S, Maleki Dizaj S, Yari Khosroushahi A. Effect of the surface modification, size, and shape on cellular uptake of nanoparticles. Cell Biol Int. 2015;39(8):881-890. Sahni JK, Doggui S, Ali J, Baboota S, Dao L, Ramassamy C. Neurotherapeutic applications of nanoparticles in Alzheimer's disease. J Control Release. 2011;152(2):208-231. Salatin S, Jelvehgari M, Maleki-Dizaj S, Adibkia K. A sight on protein-based nanoparticles as drug/gene delivery systems. Ther Deliv. 2015;6(8):1017-1029. Masserini M. Nanoparticles for brain drug delivery. ISRN biochem. 2013;2013: Article ID 238428, 18 pages. Behera AK, Barik BB, Pandya S, Joshi S. Formulation and evaluation of Isoniazid loaded-∑-polycaprolactone nanoparticles. J Pharm Res. 2012;5(2):798-802. Das S, Suresh PK, Desmukh R. Design of Eudragit RL 100 nanoparticles by nanoprecipitation method for ocular drug delivery. Nanomedicine. 2010;6(2):318-323. Devarajan PV, Sonavane GS. Preparation and in vitro/in vivo evaluation of gliclazide loaded Eudragit nanoparticles as a sustained release carriers. Drug Dev Ind Pharm. 2007;33(2):101-111. Pignatello R, Bucolo C, Puglisi G. Ocular tolerability of Eudragit RS100® and RL100® nanosuspensions as carriers for ophthalmic controlled drug delivery. J pharm sci. 2002;91(12):2636-2641. Fessi H, Puisieux F, Devissaguet JP, Ammoury N, Benita S. Nanocapsule formation by interfacial polymer deposition following solvent displacement. Int J Pharm. 1989;55(1):R1-R4. Quintanar-Guerrero D, Allémann E, Fessi H, Doelker E. Preparation techniques and mechanisms of formation of biodegradable nanoparticles from preformed polymers. Drug Dev Ind Pharm. 1998;24(12):1113-1128. Hornig S, Heinze T, Becerbc CR, Schubert US. Synthetic polymeric nanoparticles by nano-precipitation. J Mater Chem. 2009;19(23):3838-3840. Chin SF, Azman A, Pang SC. Size controlled synthesis of starch nanoparticles by a microemulsion method. J Nanomater. 2014;2014: Article ID 763736, 7 pages. Adhikari U, Goliaei A, Tsereteli L, Berkowitz ML. Properties of poloxamer molecules and poloxamer micelles dissolved in water and next to lipid bilayers: results from computer simulations. J Phys Chem B. 2016;120(26):5823-5830. Amini H, Ahmadiani A. 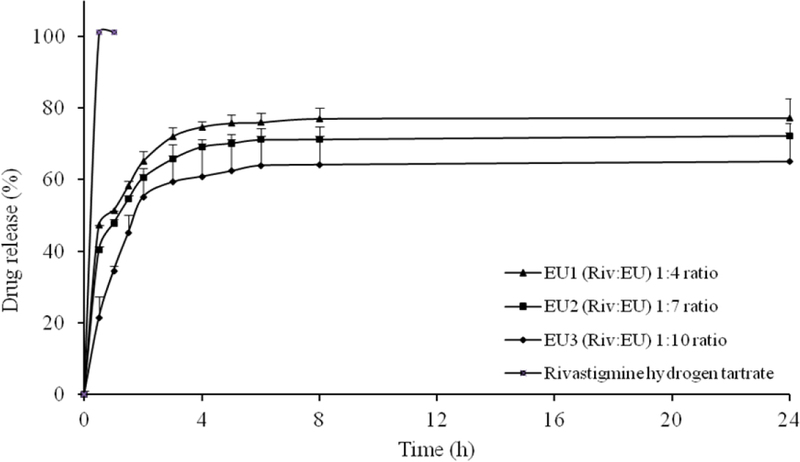 High-performance liquid chromatographic determination of rivastigmine in human plasma for application in pharmacokinetic studies. Iran J Pharm Res. 2010;9(2):115-121. Pagar K, Vavia P. Rivastigmine-loaded L-lactide-depsipeptide polymeric nanoparticles: decisive formulation variable optimization. Sci Pharm. 2013;81(3):865-885. Joshi SA, Chavhan SS, Sawant KK. Rivastigmine-loaded PLGA and PBCA nanoparticles: preparation, optimization, characterization, in vitro and pharmacodynamic studies. Eur J Pharm Biopharm. 2010;76(2):189-199. Betancourt T, Brown B, Brannon-Peppas L. Doxorubicin-loaded PLGA nanoparticles by nanoprecipitation: preparation, characterization and in vitro evaluation. Nanomedicine (Lond). 2007;2(2):219-232. Loveymi BD, Jelvehgari M, Zakeri-Milani P, Valizadeh H. Design of vancomycin RS-100 nanoparticles in order to increase the intestinal permeability. Adv Pharm Bull. 2012;2(1):43-56. Sah E, Sah H. Recent trends in preparation of poly (lactide-co-glycolide) nanoparticles by mixing polymeric organic solution with antisolvent. J Nanomater. 2015;2015: Article ID 794601, 22 pages. Verma P, Gupta RN, Jha AK, Pandey R. Development, in vitro and in vivo characterization of Eudragit RL 100 nanoparticles for improved ocular bioavailability of acetazolamide. Drug Deliv. 2013;20(7):269-276. Miladi K, Ibraheem D, Iqbal M, Sfar S, Fessi H, Elaissari A. Particles from preformed polymers as carriers for drug delivery. EXCLI J. 2014;13:28-57. Katara R, Majumdar DK. Eudragit RL 100-based nanoparticulate system of aceclofenac for ocular delivery. Colloids Surf B Biointerfaces. 2013;103:455-462. Seremeta KP, Chiappetta DA, Sosnik A.. Poly (åcaprolactone) Eudragit RS100 and] Poly (å-caprolactone), Eudragit RS100 Blend submicron particles for the sustained release of the antiretroviral efavirenz. Colloids Surf B Biointerfaces.. 2013;102:441-449. Govender T, Stolnik S, Garnett MC, Illum L, Davis SS. PLGA nanoparticles prepared by nanoprecipitation: drug loading and release studies of a water soluble drug. J Control Release. 1999;57(2):171-185. 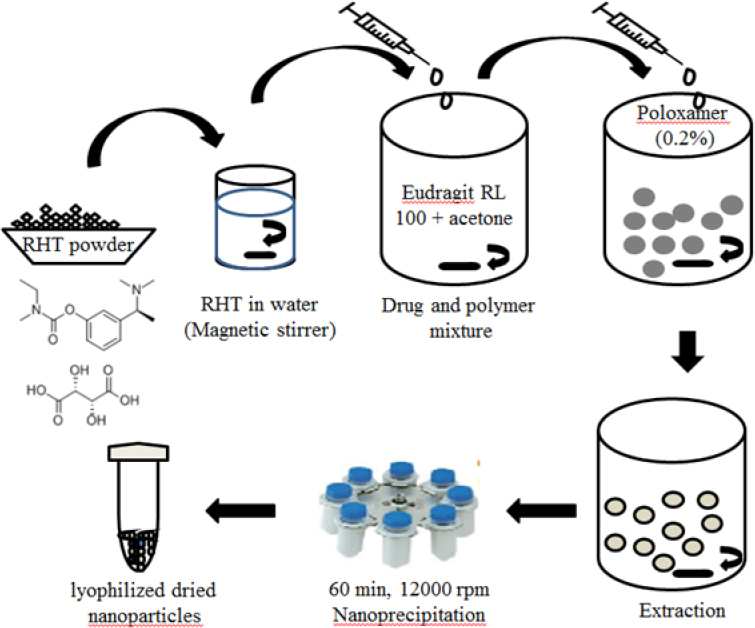 Bilati U, Allémann E, Doelker E. Development of a nanoprecipitation method intended for the entrapment of hydrophilic drugs into nanoparticles. Eur J Pharm Sci. 2005;24(1):67-75. Barichello JM, Morishita M, Takayama K, Nagai T. Encapsulation of hydrophilic and lipophilic drugs in PLGA nanoparticles by the nanoprecipitation method. Drug Dev Ind Pharm. 1999;25(4):471-476. Alshamsan A. Nanoprecipitation is more efficient than emulsion solvent evaporation method to encapsulate cucurbitacin I in PLGA nanoparticles. Saudi Pharm J. 2014;22(3):219-222. 33. Emami J, Shetab Boushehri MS, Varshosaz J. Preparation, characterization and optimization of glipizide controlled release nanoparticles. Res Pharm Sci, 2014;9(5):301-314. Bilati U, Allémann E, Doelker E. Nanoprecipitation versus emulsion-based techniques for the encapsulation of proteins into biodegradable nanoparticles and process-related stability issues. AAPS PharmSciTech. 2005;6(4):E594-E604. Peltonen L, Aitta J, Hyvönen S, Karjalainen M, Hirvonen J.Improved entrapment efficiency of hydrophilic drug substance during nano-precipitation of poly(l)lactide nanoparticles. AAPS PharmSciTech. 2004;5(1):E16. Yadav SK, Mishra S, Mishra B. Eudragit-based nanosuspension of poorly water-soluble drug: formulation and in vitro-in vivo evaluation. AAPS PharmSciTech. 2012;13(4):1031-1044. Sahu BP, Das MK. Nanosuspension for enhancement of oral bioavailability of felodipine. Appl Nanosci. 2014;4(2):189-197. Emami J, Kazemali MR. Design and in vitro evaluation of a novel controlled onset extended-release delivery system of metoprolol tartrate. Res Pharm Sci. 2016;11(1):81-92. Sharma D, Maheshwari D, Philip G, Rana R, Bhatia S, Singh M, et al. Formulation and optimization of polymeric nanoparticles for intranasal delivery of lorazepam using Box-Behnken design: in vitro and in vivo evaluation. BioMed Res Int. 2014;2014: Article ID 156010, 14 pages. Sutradhar KB, Khatun S, Luna IP. Increasing possibilities of nanosuspension. J Nanotechnol. 2013;2013: Article ID 346581, 12 pages.